It’s science fair season in Greenwood, Wisconsin. A week ago I asked what kinds of things the generation of LEGO would create when they grew up. I think that I may have discovered what the future may hold for the amateur engineers in my classroom. Enter the world of “makers.” Often referred to as “hackers,” these are not the notorious computer criminals of my childhood. The term “hack” now refers to modifying any device, computer program, or skill to improve one’s life—basically, anything under the DIY umbrella. By this definition you may be hacking and not know it. For example, that baseball card you put in your bike spokes as a kid? Yeah, you hacked your bike. What is interesting when cruising the sites dedicated to this new, broader vision of engineering is the creativity and technical skill of these ‘makers,’ as they call themselves. Many of the creations I found, such as the pedal-powered blender, seemed to be creation for creation’s sake. However, many seemed to have a genuinely humanitarian and educational goal. For example, the Civilization Construction Set is basically a giant LEGO set of metal and hydraulics that, assembled in the right way, can provide a community with infrastructure. Arrange the parts one way, you have a tractor to plow a field. Rearrange the parts and you have a brick making machine or a blast furnace. The group created all the CAD drawings in their spare time and has even prototyped many of their projects. I showed this to my science club and a few of my more gearhead-oriented students, and they were ecstatic seeing how what they were learning could be applied on a larger scale. A trip to the Maker magazine website is akin to traveling through a candy store of cleverness. I believe this spirit is the future of Tech Ed programs. Give students the tools they need to solve realistic problems and the freedom to tinker. Many of the production tools that used to be solely industrial have now trickled down to the consumer and educational level. There are several microcontroller kits that allow students to create their own networked and easily programmable minicomputers that can fit inside a shoebox or Altoid tin—the same technology present in every factory’s automation line. HP now sells a 3D DesignJet printer. For a mere $18,000, a high school student can prototype anything created in CAD. But why worry about price? 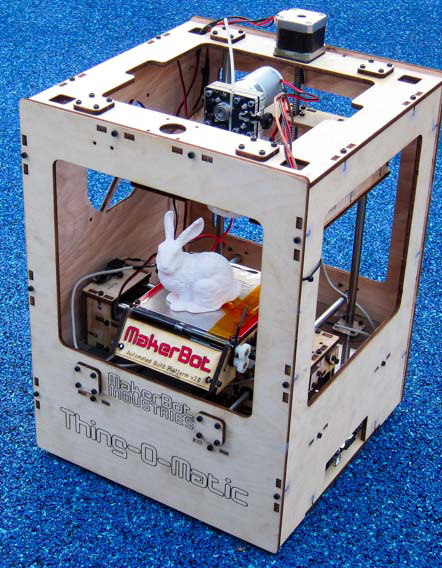 Some of these same ‘Hackers’ I spoke of before created the MakerBot Thing-o-Matic, a 3-D printer that can create any 3-D object you can imagine for under $1,300. This is not for the faint of heart, because in the spirit of DIY you have to assemble the Thing-O-Matic yourself. For Tech Ed people, this tool would revolutionize the classroom. Imagine a group of kids who need a custom part for their LEGO robot, something never devised before; the Thing-O-Matic creates a prototype from scratch in about an hour. They design their very own sports car and in a few minutes they could have a scale model. We are truly coming to a point where the technology is limited by our imaginations and not the other way around.